Peyton Or Tom? Which QB Do You Want When Game's On The Line? : The Two-Way Let the debate begin: If you could choose which current quarterback to have on your team when it's behind in a big game, who would it be? Peyton Manning, Tom Brady or someone else? Denver Broncos quarterback Peyton Manning, left, and New England Patriots quarterback Tom Brady in 2012. There's nothing like a "who's the best quarterback" debate to get NFL fans going. Who's the quarterback you'd like to see in charge when your team's behind in a playoff game with time running out? Now, there are probably a half dozen or so current quarterbacks who fans might suggest. But for the sake of argument, we've crafted a question that focuses on two of them — Manning and Tom Brady of the New England Patriots. Would you prefer Manning even though his post-season record (9 wins and 11 losses) isn't stellar? 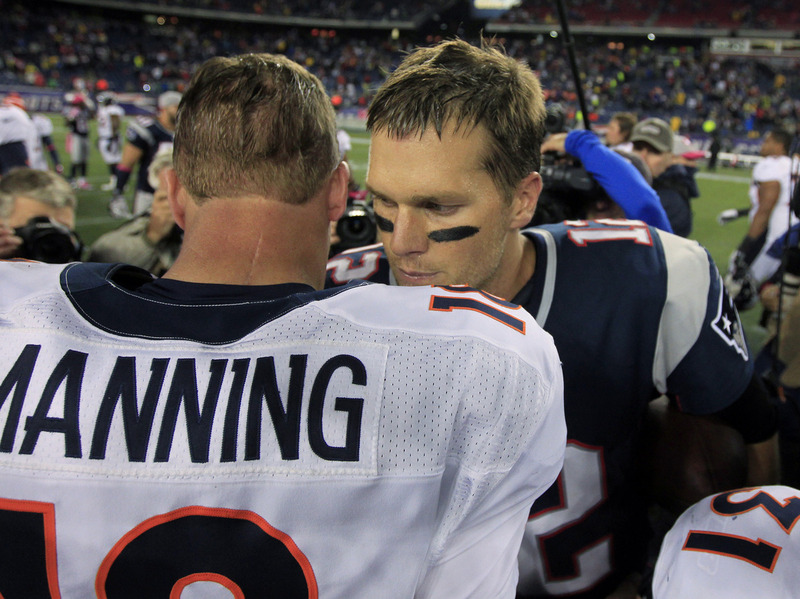 Or would you want Brady, who has three Super Bowl rings to Manning's one? Feel free to suggest others in the comments thread. What about Aaron Rodgers of the Green Bay Packers, who was the Super Bowl MVP in 2011 and has some of the gaudiest stats among current QBs? Drew Brees of the New Orleans Saints could be a popular choice. So might Eli Manning of the New York Giants, who hasn't had a great season this year but has one more Super Bowl ring than his more lauded brother. There's also Ben Roethlisberger of the Pittsburgh Steelers, another two-time Super Bowl winner. We know it's hard, but when answering our non-scientific survey, we ask that you set aside team loyalties if you can. Here's the situation: Your team is down by 6 points with 2 minutes to go; its 80 yards from the goal line. Which current quarterback do you want behind center?